Identical jazz twins from NYC. 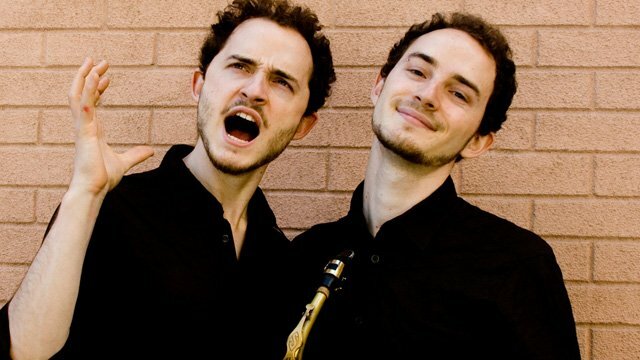 The Le Boeuf Brothers are “talented musicians and award-winning composers who channel their influences, environments, and resources into works that reflect their own identities.” (All About Jazz). Pianist Pascal Le Boeuf and saxophonist Remy Le Boeuf “pursue a hyper-fluent streamlined modern ideal” (New York Times) with “an impressive level of sophistication.” (San Francisco Chronicle). In addition to their work as performer/composers with Le Boeuf Brothers, Remy and Pascal take part in a number of diverse projects. Remy has performed as a sideman with Grammy Award-winning saxophonist Donny McCaslin, Bob Mintzer, and opened for Dirty Projectors. He has also received commissions from the Jerome Foundation and Chamber Music America. Pascal frequently tours with his trio featuring bassist Linda Oh and Justin Brown. He has played as support for D’Angelo’s Black Messiah tour with Australian pop artist Meg Mac, jazz vocalist Allan Harris and the 15-piece gospel-funk band Jesus On the Mainline. Pascal composed music for the 2008 Emmy Award-winning movie King Lines, and is currently pursuing a Ph.D. in Music Composition at Princeton University as a Naumburg Doctoral Fellow.